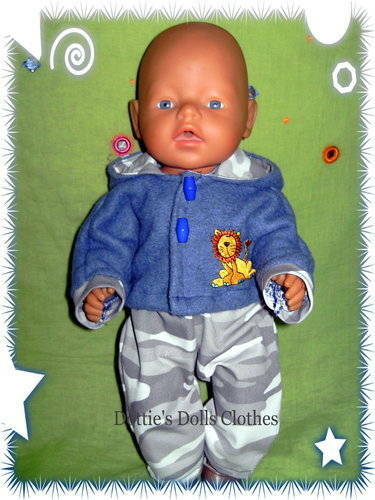 Most of my outfits are individual, so if you're looking to buy original baby doll clothes with style to fit most of the popular brand dolls, including boy doll clothes, this is the place to look. I design and make these dolls outfits myself and try to include a wide variety of styles to suit most popular dolls of today. Please check back regularly as I add new designs on a regular basis.. I sew on buttons, motifs and other small parts as securely as possible but please check these small parts secureness regularly as you would with any other toy you give to your child. These dolls clothes are not meant to be given to under threes. It may take up to two weeks if you live in the UK, or maybe longer if you live out of the UK, as this is a small one woman business, and I make all these outfits myself, please consider this time span when ordering for birthdays etc., and order early please to avoid disappointment. If there is anything you wish for that isn't on these pages for the specified dolls drop me an e-mail. I'm sorry but I only do outfits for the size of the dolls shown, and only do custom orders for the same size dolls that are shown in the shop, there are so many different dolls out now and I like to get measuremants and fittings correct, and couldn't possibly do it for all the dolls out now. To avoid disappointment contact me and I will advise you on size. Custom orders may take longer than the two weeks delivery period. Most of the outfits are washable on a 30° wash cycle. (unless otherwise stated). Some of my outfits are embellished with gemstones for which I use the hotfix system, these are more reliable than the glued on gemstones but need to be washed with the garment turned inside out and not tumble dried. The dolls, shoes,( although I do sell shoes in the footwear category) hair ornaments etc. shown in the photos, are not included in the sale of the items, only the items described are for sale.